Insight into every property, street and suburb in New Zealand from the world’s leading property analytics provider. New Zealand’s leading source for property information and advice. Get access to property information for a specific address, street, suburb or region. From Rating Valuations and previous sales of the property, to more detailed local sales, Certificate of Title and building consent information. Get an instant estimate of the current market value for a property. Based on recent, nearby comparable properties and other data and E-valuer gives you a better understanding of what a property is worth today. 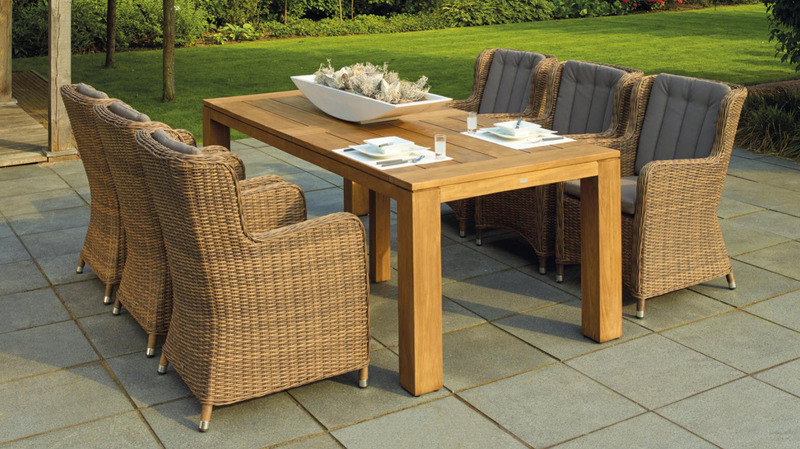 Whether you require a quick overview or all the information available on a property we have a property pack to suit your needs. Access a range of local information whether you’re searching a specific address, street, suburb, town or city. You receive insight into the local demographic, weather, schools, market and more! Whether you’re buying a family home or looking for an investment our property data and latest statistics can help you to understand the market better. For most of us owning property is the biggest investment we will ever make. Ensure you are making informed decisions based on sound information and insights. "Love the independent info I can now get via the QV Homeguide app..."
"Values for suburbs that show historical change were very useful in figuring out a fair price when buying and selling.."
"Information for property is right at your fingertips. ."
"QV.co.nz was a tremendous help with getting us the information to make the right decision.."
A recent ‘on-the-ground’ tour around Auckland revealed that new housing construction is moving ahead with infill development a rising trend. KiwiBuild will help to drive even more infill housing, making more efficient use of inner city land (not to mention removing some poor quality housing). However, new sections still seem pretty expensive and transport infrastructure is a problem. The shortage of housing in Auckland is clearly one of the biggest issues in NZ’s residential property market at present (and it will probably remain one of the biggest issues for some time to come). This Pulse sets out some observations from an ‘on-the-ground’ look around Auckland’s various sub-markets last week; some positive surprises, but also some reasons for concern. Firstly, contrary to perception that Auckland has been at a supply standstill for many years now, a huge amount of development has actually already taken place, both for standalone houses (e.g. Pokeno) and townhouses (e.g. Stonefields). The scale is huge compared with any other part of NZ and, without it, the housing affordability problem in Auckland would be even worse. The Stats NZ figures clearly illustrate the relative shift towards smaller dwellings in recent years (see first chart), with apartments/townhouses etc. now outnumbering houses. On top of that, it’s easy to see that infill development is on a rising trend. And that’s backed up by our data. As chart no. 2 shows, five years ago, the change in the dwelling stock in Auckland over a 12-month period was similar to how many dwellings were consented. 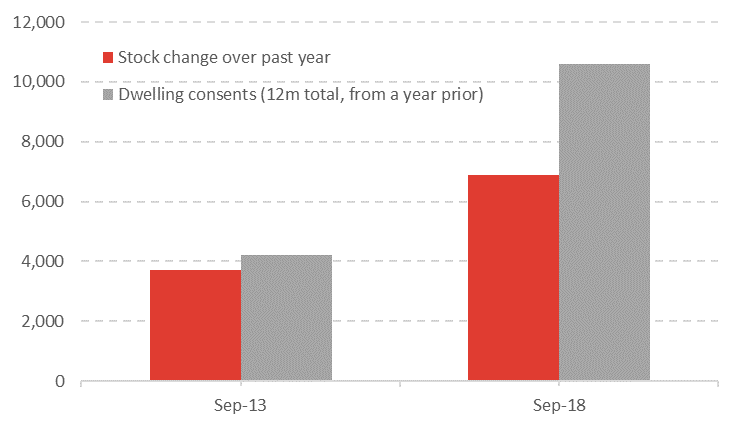 Lately, however, the stock has been growing more slowly than dwelling consents – illustrating that rising shares of consents have been granted to replace older houses that have been demolished. 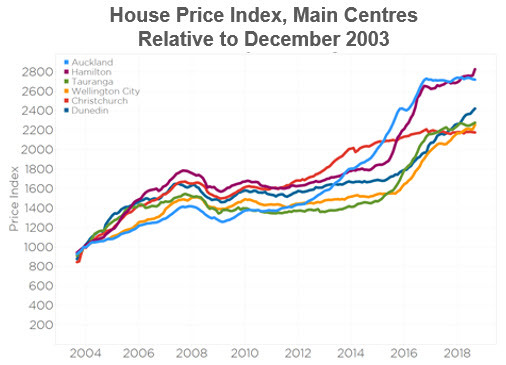 The pattern in Auckland has been much starker than in Wellington, for example, where the stock change has stayed consistent in relation to dwelling consents (see chart three). The rise of infill townhouse/apartment construction is of course very welcome in terms of making better use of big sections that currently only have one, small (often poor quality) standalone house on them. However, more needs to be done. The inefficient use of state housing land is clear around Mt Albert and Mt Roskill, for example, so KiwiBuild is well-targeted in those areas. It gets harder when the properties are privately owned, and the current owners cannot (e.g. for financial reasons) or will not move elsewhere and free up that land for more efficient use. 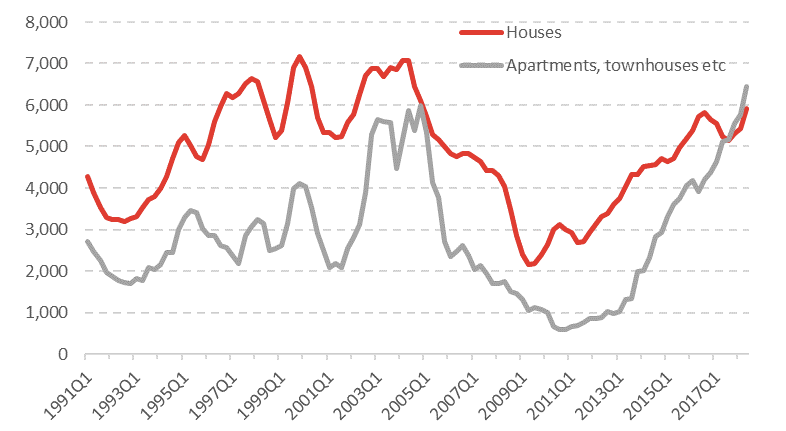 But even though there are some positive factors on the supply-side in Auckland, housing affordability is still poor. And that’s despite no obvious physical shortage of land (e.g. look at Pukekohe with its large numbers of new, empty sections). Thus the question naturally arises – why isn’t supply moving even faster? Three obvious hurdles exist here. Firstly, although the land physically exists, it doesn’t seem to be available at the ‘right price’. Sections priced in excess of a hefty $500,000-600,000 were easy to find. Secondly, part of the reason why land is still expensive will be the need to develop the infrastructure to support new housing, especially transport. Finally, it’s the well-known builder shortages and capacity constraints in the construction industry. On the whole, the worst critics of Auckland’s supply shortfall are probably overstating the problem. The land exists, infill housing is underway and KiwiBuild will help to speed this up. However, there is still a long way to go in terms of boosting the raw numbers of homes in Auckland, not to mention fixing a quality issue (e.g. poor general state of repair, lack of insulation) that clearly exists in many parts of the city. 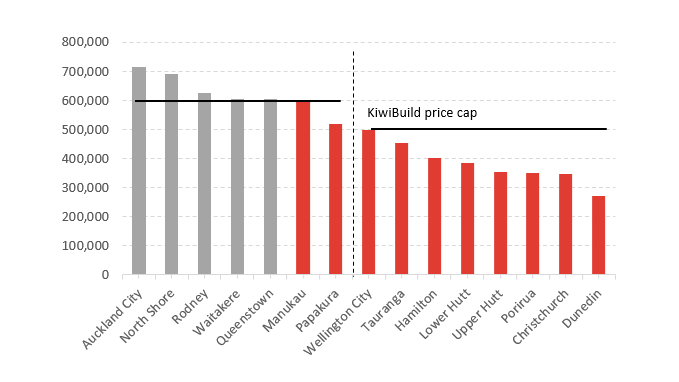 KiwiBuild Price Caps: How Do They Compare To Actual Paid Prices? In the year to date, the median prices paid by first home buyers for two or three-bedroom properties in Auckland, Queenstown and Wellington have been above the KiwiBuild caps. That potential “discount” from buying a KiwiBuild property makes it easy to see the scheme’s appeal to buyers, and that’s before you even factor in that a KiwiBuild property is new but there’s no guarantee of a new-build out on the open market. One of the key talking points of the KiwiBuild programme is the price cap by bedroom number and location. Within Auckland and Queenstown, these are $500k for one-bedroom, $600k for two-bed, and $650k for three-bed (or more). Everywhere else, the cap is $500k regardless of bedroom count. So how have actual prices paid by first home buyers (FHBs) lately compared to those caps? For one-bedroom properties (new or existing) in 2018 year-to-date*, across areas such as Waitakere, North Shore, and Wellington, FHBs have paid median prices below the cap (see the first chart). 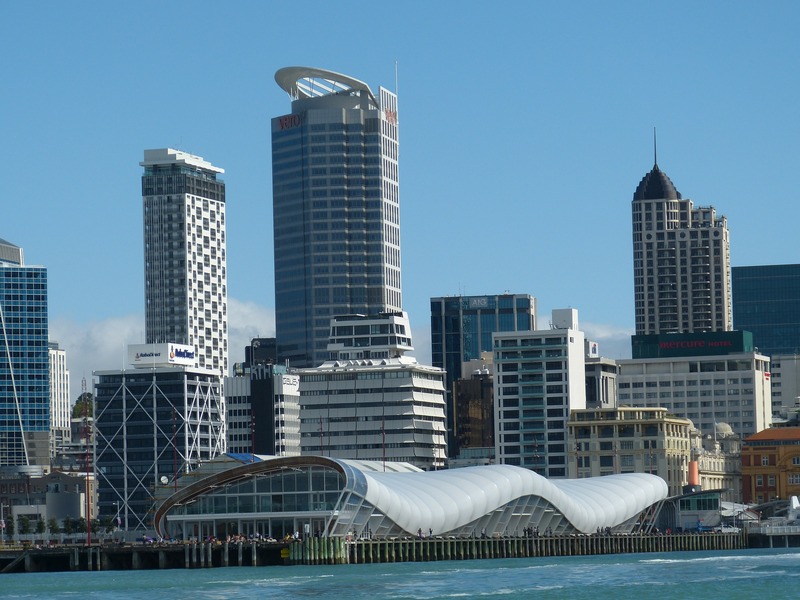 A median price paid of $550,000 in Auckland City, however, is $50,000 above the KiwiBuild price cap for a new property. The price cap starts to look more meaningful in the two-bedroom bracket in Auckland and Queenstown. 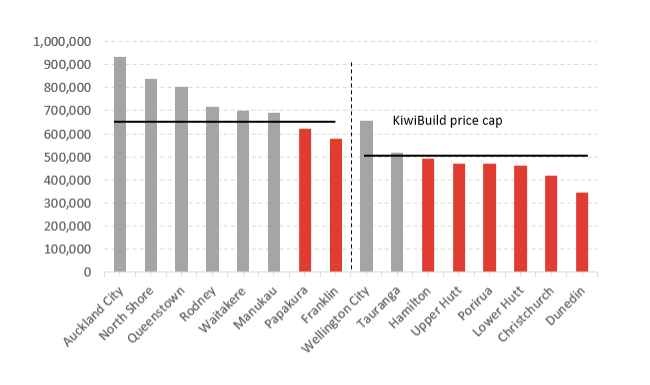 (As shown in the grey bars in the second chart, FHBs have been paying prices above the KiwiBuild cap and could therefore find the scheme pretty appealing). In Auckland City, in particular, a new two-bedroom KiwiBuild property priced at a maximum of $600,000 would be of great interest compared to the $713,000 that FHBs have recently been paying for properties of more variable age and quality. Elsewhere around the country, FHBs have been paying the highest prices for two-bedroom properties in Wellington, but even there the median $496,250 is still slightly below the cap. This cap could have even more effect in the three-bedroom bracket. Apart from Papakura and Franklin, prices paid by FHBs recently across different parts of Auckland have been comfortably above the KiwiBuild cap (refer third chart), with the same applying in Queenstown. Around the rest of the country, the three-bedroom bracket also sees the cap exceeded in Wellington and to a lesser extent Tauranga. In Wellington (KiwiBuild cap $500k), the median price paid by FHBs to date in 2018 for a larger property is $657,400. Another interesting aspect to consider is new properties themselves. In Papakura, for example (where the McLennan KiwiBuild development is located), the median value of a recently-built three-bedroom property is $684,500. That is above the $650k KiwiBuild cap. But what is most interesting is that the McLennan properties are listed for $579,000 – about $105,000 less than the “market value”. It’s important to bear in mind that these median price paid figures clearly relate only to FHBs that have already been successful in buying a property (whether that’s a new or older property). However, the aim of KiwiBuild is not so much to target or help those that can already afford property, but to ease the problems for people who’ve so far missed out. Overall, the KiwiBuild price caps will have the most bite as the number of bedrooms in a property increases. Indeed, it wouldn’t be hard to imagine would-be buyers for larger properties in Queenstown, Wellington and parts of Auckland really jumping at the chance to get into a new KiwiBuild home. And although property values in Auckland and Queenstown have generally flattened off, continued growth in Wellington will only make the KiwiBuild appeal even stronger. Property values in Auckland and Christchurch continue to track sideways, while other main centres sprang into action in September. According to the September CoreLogic QV House Price Index, property values in both Hamilton and Dunedin grew by 2.4% over the last three months. This holds the annual rate in Dunedin above 10% reflecting relatively consistent growth rates in the lower south, but it is quite the change in trend for Hamilton, where values had begun to plateau from March this year. 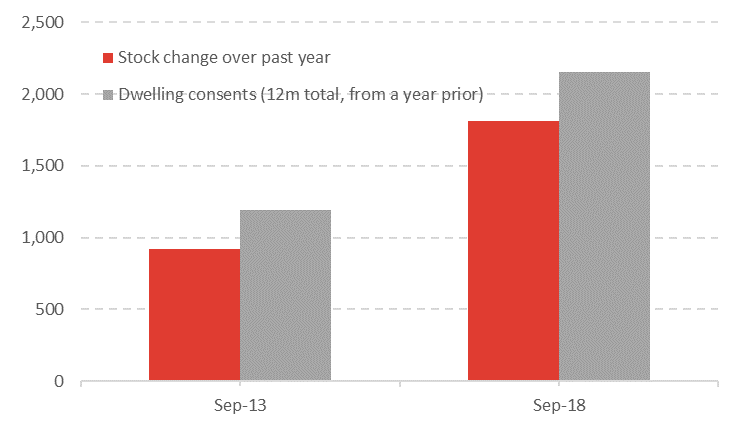 In more good news, CoreLogic head of research Nick Goodall said, “The number of new listings over the past three weeks in the wider Waikato region is also 22% higher than the same time last year, providing a much needed boost in available stock for prospective buyers, however, it’s worth noting that Hamilton’s annual value growth remains below 5%. Wellington City and Tauranga showed similar, if slightly smaller, bounce-backs in value, with 1.9% and 1.4% quarterly growth respectively, to the end of September 2018. ”Potential changes which could impact investors was the government’s Tax Working Group interim report which floated two possible options of ‘tax on capital assets’, designed to make the tax system ‘fairer’. “Despite KiwiBuild ballots opening, and subsequently being touted as potential ‘lotto wins’ for the successful applicants, first home buyer activity remains strong, suggesting not everyone is hanging their hopes on entering the market via the Government scheme,” he said. 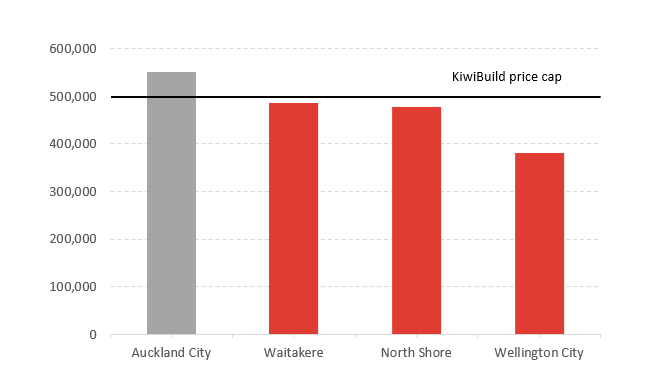 Meanwhile, values in Auckland dropped 0.7% over the last three months, driven by a greater weakness in the more expensive areas of Auckland City (-1.1%) and North Shore (-0.8%). Much further from town, Franklin was the only Auckland area to see growth over the last three months (1.2%). In Wellington, anecdotes of continued growth in the market are backed up in September’s index results. Values are up 1.9% over the last three months in the City, while Upper Hutt saw a slight drop in quarterly growth rate (to +1.8%) but it retains the highest annual growth figure for the region of 8.8% (above Wellington City’s 8.5%). 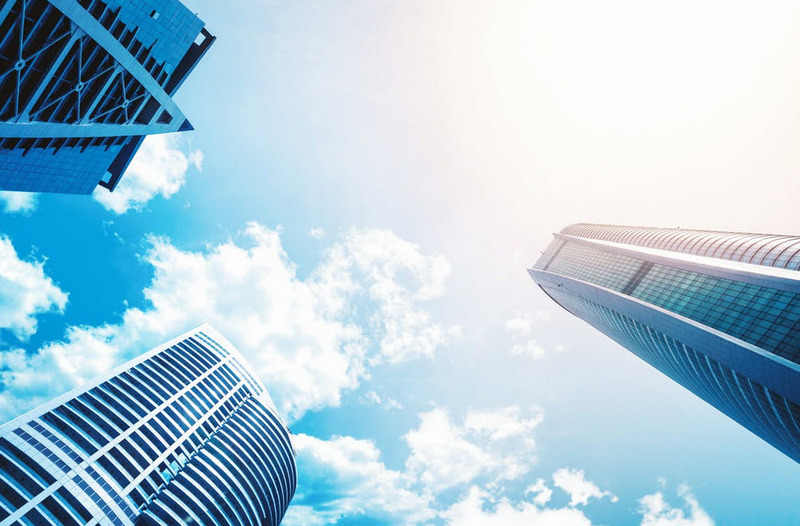 Across the other main urban areas, a relatively distinct trend has appeared, with the four lower value centres topping the annual value growth rate chart. 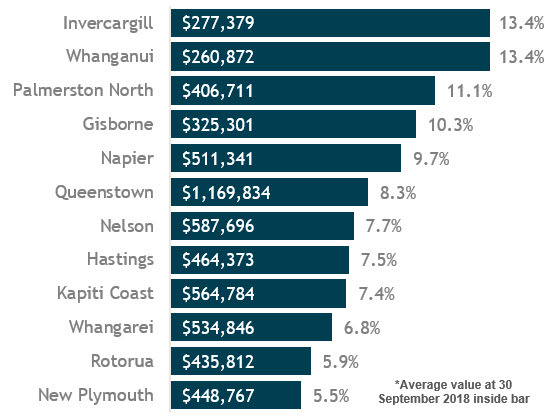 Whanganui (average value $260k) joins Invercargill ($277k) at a rate of 13.4% over the last 12 months. Palmerston North ($406k) and Gisborne ($325k) also saw property values grow by more than 10% over the last year as competitive mortgage interest rates support affordability for those who can satisfy bank lending criteria. Values grew 2.6% over the last three months in Hastings, perhaps a reflection of the slightly better affordability as the average value is almost $50k lower compared to its Hawke’s Bay neighbour. Meanwhile a minor lift in values in the Queenstown Lakes District could reflect a late surge before the Foreign Buyer Ban is enacted, however longer term prospects for the popular tourist district appear to be less prosperous. New Plymouth values continued to track sideways. Clearly there’s more to the region than just mining, but future growth will likely remain constrained as people consider their future employment prospects. While some of the macro-economic factors (GDP growth, net migration) which influence the property market, are weakening, we can’t ignore the influence of credit availability and with banks dropping mortgage interest rates, and subsequently increasing their loan book, demand is holding up. “The short term supply situation, as measured by properties on the market, also remains low across most of the country, excluding Auckland. 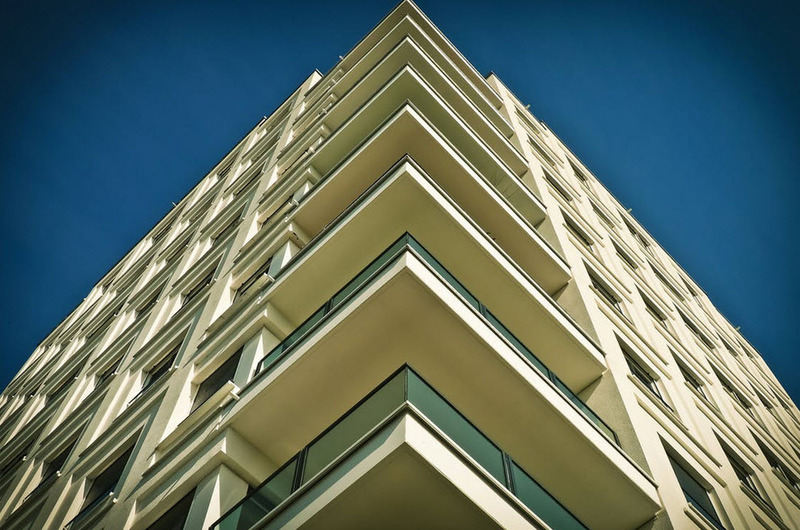 And while we’ve seen the typical spring lift begin to occur already, overall levels are historically low, which means some price pressure persists for those properties currently on the market”. The more medium-to-long term supply situation (as measured by construction of new properties) is seeing some positive progress. We’re seeing record levels of building consents being issued in Auckland and the reality of KiwiBuild in improving the affordability of new builds is starting to become clearer. However we know all too well about the deficit created from years of under-building (combined with strong population growth) and this shapes the over-arching outlook of values holding up for the time being. 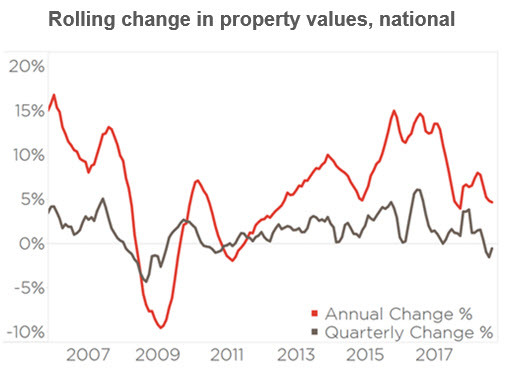 Two factors to watch are the labour market and property investor activity. The labour market is currently pretty strong but could be unduly influenced by overseas factors, not to mention a reduction in business investment locally. In summing up, Mr Goodall explains: “Market activity remains somewhat constrained; however there is cause for optimism, in the form of a recent increase in credit flows. This appears to be relatively unique to NZ and we wouldn’t expect it to continue to increase exponentially, especially with more information coming to light across the ditch via the Australian Banking Royal Commission”.